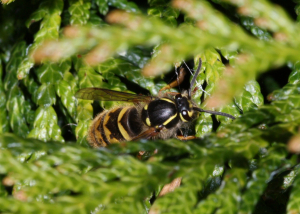 Observation - Wasp - Dolichovespula sp.? - UK and Ireland. Description: I think I have the genus, but is the species id possible? Sorry there's no photo of the face. I think I have the genus, but is the species id possible? Sorry there's no photo of the face.